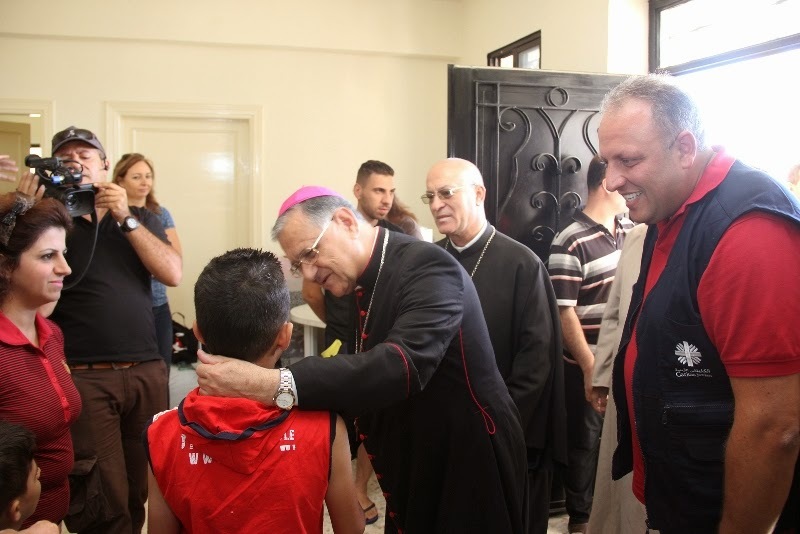 JORDAN- on Wednesday, August 27, Latin Patriarch of Jerusalem Fouad Twal visited Mosul Christians displaced in Jordan. He lauded Jordan’s official efforts designed to alleviate the suffering of Christians in Mosul and the persecution conducted against them. During a visit to the Catholic Church-affiliated centers that house the displaced from Mosul and other Iraqi cities, Patriarch Twal said: “His Majesty King Abdullah II has consistently shown interest in preserving the Arab Christian identity as he called last year for the convening of a conference to discuss the challenges facing the Christian Arabs. These days, he is translating, through his sublime deeds, his love and care to open the doors of the Kingdom to receive the brothers and sisters fleeing from persecution and oppression. 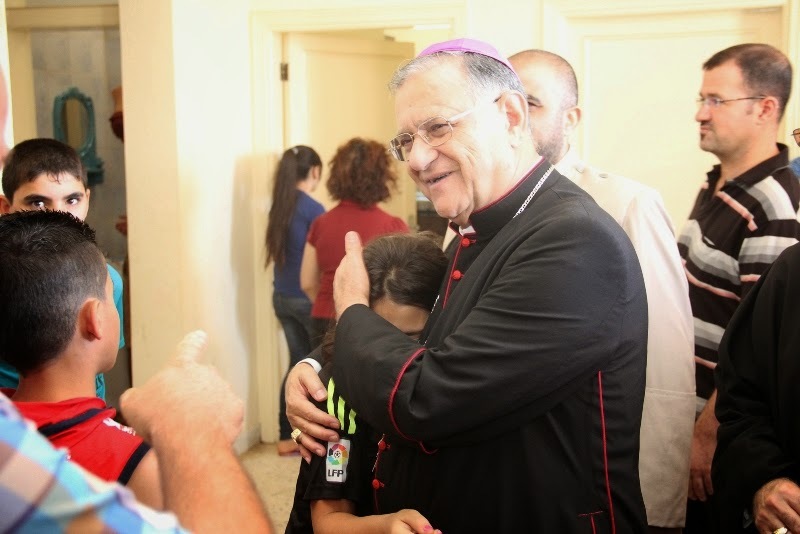 The patriarch said: “In the wake of every crisis, Jordan opens its doors wide and we are grateful and thankful for that.” Furthermore, in his capacity as chairman of Caritas, he praised Caritas’ efforts in providing shelter, food and medicine for hundreds of people who came in the past few weeks in search of a safe haven. He said that Caritas was founded in Jordan 45 years ago and has always been in the service of the needy and the poor, as well as whoever knocks on the door seeking peace. Patriarch Twal also visited the centers housing those displaced from Mosul at the Latin Church in Marka and listened to remarks by Fr. Khalil Ja’ar, regional director of the Messengers of Peace Association. 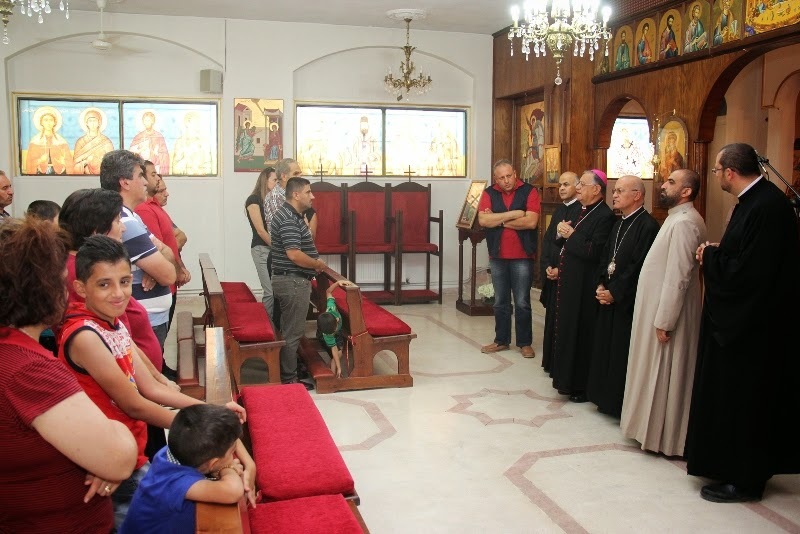 He also visited the Roman Catholic Church of Mar Elias in Marj Al Hamam and listened to a briefing from parish priest Fr. George Sharayha. He later visited the Our Lady of Peace Center and listened to a briefing from the center’s director, Fr. Ala’ Alamat. The patriarch also reiterated his condemnation of the atrocities to which the Iraqi citizens in general and Christians in particular are subjected to. He said that what is happening really shows that man can be transformed into a wolf in the face of his fellow man, but love on the other hand makes man capable to reconcile with himself and with his ideas, and consequently with his religion and his fellow man. Patriarch Twal recalled the views of His Holiness Pope Francis and the patriarchs who had gone to Erbil to express solidarity with the displaced saying: “We will exert every efforts to preserve the genuine image of coexistence, for terrorism has no religion, and genuine Islam has nothing to do with the criminal acts conducted against the Christians who have been–throughout history–sincere to building their homeland and society. Patriarch Twal was accompanied in the visit by Bishop Maroun Lahham, Fr. Noor Al-Qis Mousa Vicar of the Syriac Catholics, Mr. Wael Suleiman, director of Caritas, in addition to Fr. Rif’at Bader, director of the Catholic Center for Studies and Media.